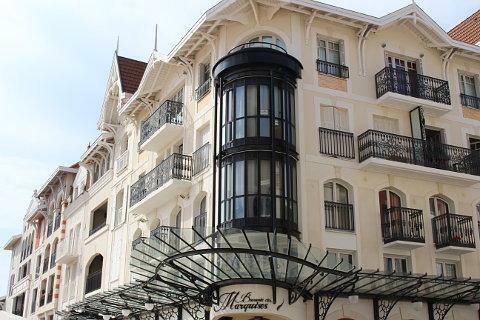 The resort town of Arcachon is a very popular coastal destination in south-west France. The resort is to the west of Bordeaux at the northern end of the longest, sandiest coast in Europe, stretching 200 kilometres southwards to Biarritz. The coast is known as the Côte d'argent ('the silver coast'). Historically popular as a destination for people from Bordeaux to escape to at weekends it has now developed into one of the most popular and attractive seaside destinations in France. France This Way comment: we have visited the majority of the hundreds of resorts around the coast of France including those along the Mediterranean Riviera, the Atlantic and the English Channel , and also spend a lot of time in Arcachon, and can honestly say that the town is probably our favourite French summer beach resort. The principal attractions in Arcachon include several kilometres of beautifully maintained sandy beaches, a town centre with its markets and vibrant atmosphere, and the 'winter town' (the "ville d'hiver") with its extensive number of grand villas built in the 1860's, and the most complete 'belle epoque' town you will find anywhere in France. 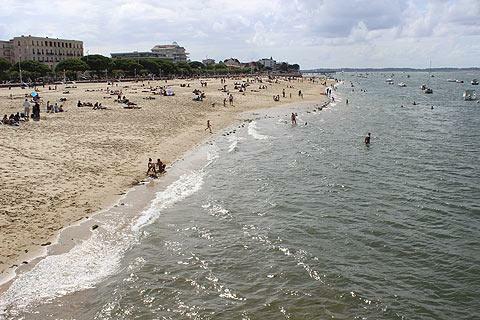 The beach in the centre of Arcachon is not exposed to the full might of the Atlantic waves, being on the edge of a large inlet, the Bassin d'Arcachon, rather than facing the sea directly. This makes the beaches particularly good for children. As a visitor you will want to explore each of these areas, although the shops, restaurants and activities of the Summer Town are the main centre for visitors. 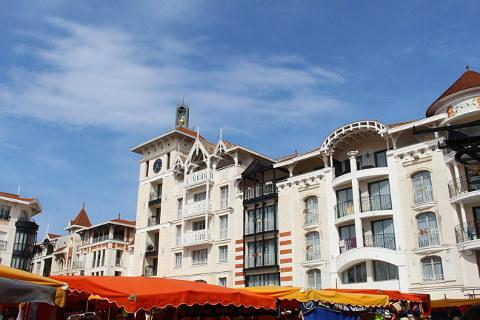 There is also a large market squre and indoor market in this part of Arcachon which has been beautifully restored in recent years. The seafood restaurants in Arcachon are of course particularly popular and if you are looking for a cheap but tasty treat then 'Moules frites' (mussels and chips) are offered in many of the restaurants, especially along the beach. Head a short distance away from the beach front and it is easier to find restaurants offering high quality food at decent prices. Behind the summer town climb to the extensive Parc Mauresque, from where you can start exploring the Winter Town, our favourite part of Arcachon and well worth exploring for the magnificent and often quite eccentric houses that were built in the second half of the 19th century. Arcachon contains a large number of interesting and ornate old houses, sometimes almost verging on the Disneyesque, a tribute to the days when many rich merchants set up home here (see more details below). 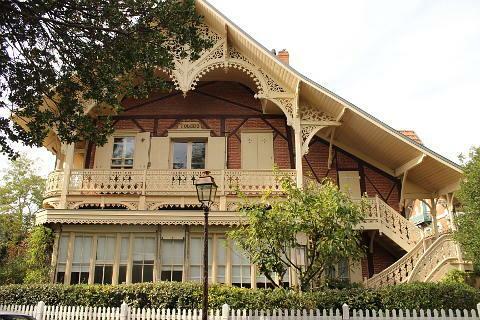 Various tourist trains and buses also tour Arcachon and include some of the most important villas in the Ville d'Hiver if you prefer to sit down and have a commentary while exploring. Exploring in your own car would be possible but you would most likely miss most of the highlights in the many side-streets! After reading about the main attractions below you can see our special guide to five unmissable highlights in Arcachon to see our overall favourites! There are four main beaches in Arcachon, the Plage Pereire, the Plage d'Arcachon, the Plage d'Eyrac and the Plage des Abatilles. The Plage du Moulleau is only a few kilometres away. The principal town centre beach in Arcachon itself is sandy and very calm and sheltered from the strong waves and currents of the Atlantic Ocean beyond the bay: perfect for families with small children. 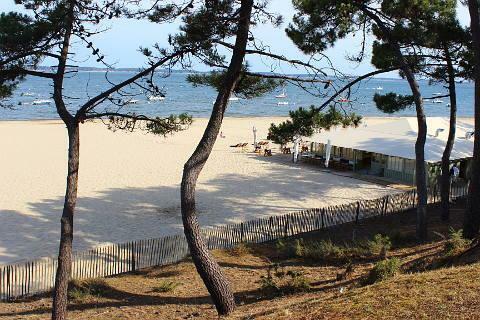 On the central beach in Arcachon you will also find beach volleyball, 'bungee jumping' and a childrens play area. 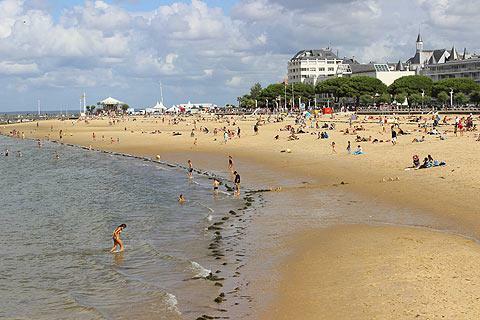 The beaches in the centre of Arcachon are very long, popular and sandy but we recommend you also walk around to the beaches to the west of the town such as Abatilles, Pereire and Le Moulleau. These are extensive sandy beaches with plenty of space for everyone and backed by pine trees. If you are looking for something further afield then there are literally miles of white sandy beaches as you continue south towards Biscarrosse, backed by pine forests and with plenty of waves for surfing and body-boarding. These beaches also have lifeguards surveilling portions of them to make them more safe for young and teenage children. If you wish to learn how to surf there are lots of surf clubs offering pretty reasonably priced lessons. 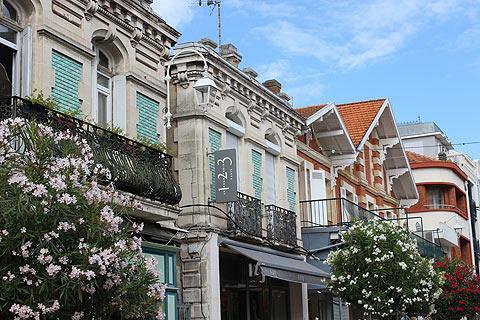 The winter town grew up in the second half of the 19th century, particularly around 1860 when a group of businessmen decided to prolong Arcachon's popular summer season into winter by promoting it as a rival to the Swiss mountains as a 'cure' for tuberculosis - see short history below. 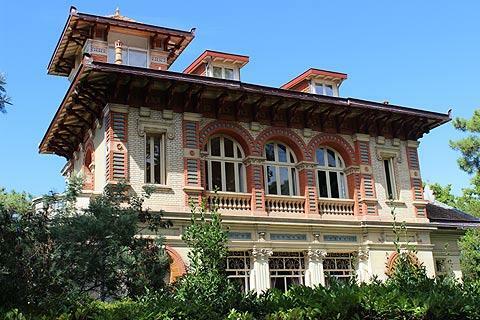 The ville d'hiver contains numerous grand villas dating from the last two decades of the 19th century and a tour of the region - either on foot or one of the guided buses or tourist trains that explore here - is a highlight of your visit. 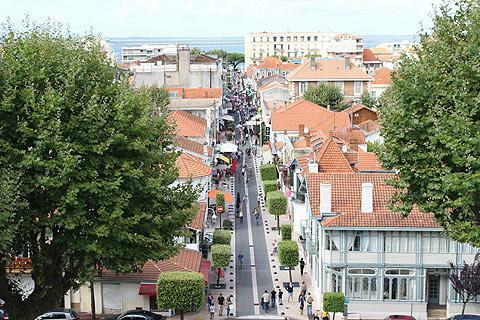 See Arcachon Ville d'Hiver for details. The 'Mode Pittoresque' was fashionable at this time and is a wonderfully eccentric mix of a number of architectural styles and building materials. 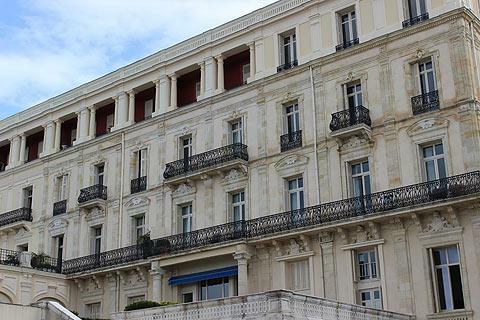 In Arcachon you can see a mix of neoclassical, neo-gothic, old-colonial and swiss chalet styles. A lack of symmetry is key and the styles incorporate mixes of chalet style roofs with brick facades and bay windows. 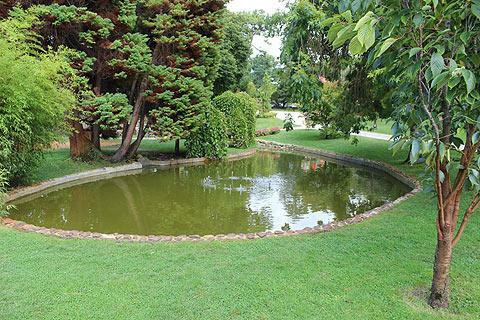 Between the Ville d'Hiver and the Ville d'Ete is the Parc Mauresque, an attractive park extending over five hectares. Reached by lift from the town below the park has wonderful views over the Bay of Arcachon and plenty of places for a picnic in the shade as well as a bandstand and various small garden features. Around the edges of the park you can see the Villa Trocadero, the Villa Graigcrostan and the Villa Teresa. This was once home to the Casino Mauresque which was inspired by the Alhambra Palace and the Cordova Mosque. Sadly this burned down in 1977. The Place des Palmiers is a small, very nicely maintained park about 100 metres beyond Parc Mauresque and towards the south of the Ville d'Hiver. 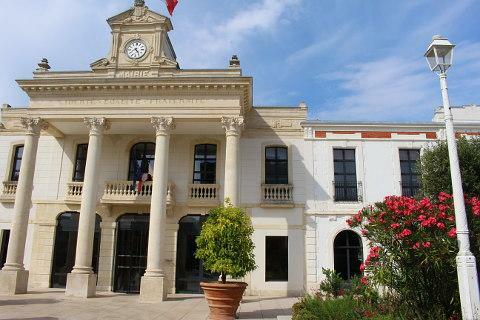 There were so many British in Arcachon at the time the town developed in the late 1800s that an Anglican church was built and next to this a square was created and a number of palm trees planted - hence its adopted name of Place des Palmiers. It is actually called the Place Alexandre Fleming. There is a lovely bandstand in the square, covered in flowers during the summer. A short distance east of Parc Mauresque, the Passarelle Saint-Paul was built in 1862 to link the dunes of Saint-Paul and Sainte-Cecile. Gustave Eiffel collaborated in the design of the Passarelle. The observatoire was added a year later. 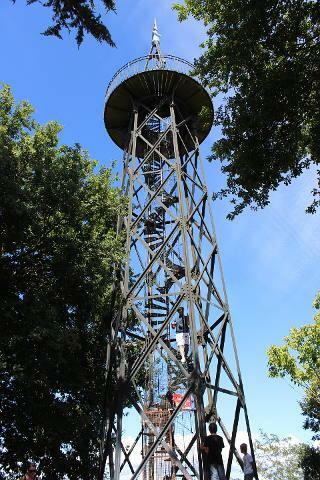 You can climb the spiral staircase to the viewing platform of this interesting metal built tower (no charge!) to can get excellent views across the town below, the sea, and over some of the villas including Villa Toledo, Villa Bremontier and Villa Faust. 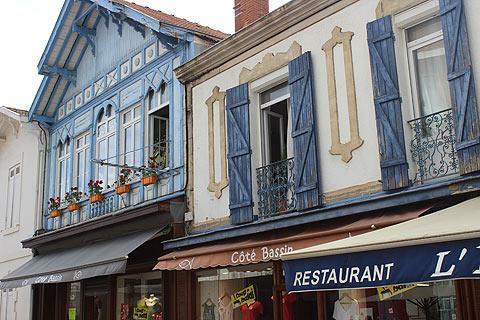 At the begining of the 19th century Arcachon was still just a small fishing village. 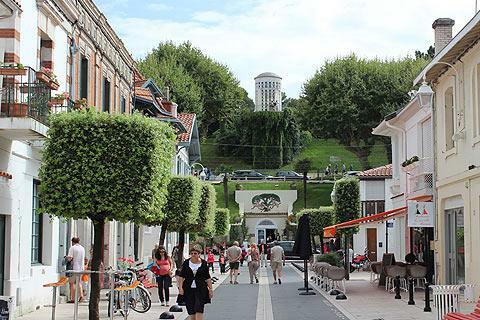 The ville d'été started growing up principally as a place of healing where sick people could take in the sea air as part of their recovery process. Then from 1860 the Ville d'hiver, with improved transport train links to Bordeaux and Paris, was developed. At the start it was an alternative to going to Switzerland for a cure for tuberculosis. The sea air and the pine forests were found to as beneficial as the mountain air and as Arcachon is in a bay it is protected from the strong winds of the rest of the Atlantic coast. A group of business men, and in particular the Pereire brothers, and the owners of the railway line between Bordeaux and La Teste came up with the idea of extending the line to Arcachon and developing Arcachon as a winter resort for tuberculosis sufferers. The commercial project wasn't a huge success but the Pereire brothers continued to develop the summer tourism and the thermal tourism (with the les Abatilles spring) and the town started to attract rich merchants from Bordeaux and the rest of France. When Napolean III came to visit Arcachon's success was assured. Alexandre Dumas lived in Arcachon for a while and Toulouse-Lautrec had a house on the sea-front. Various boat-related trips are available from the jetties in the bay. Traditional boats called "pinasse" are used for these. The boat tours will take you past the beautiful "cabanes tchanquées" which are fishing cabins on stilts right out in the middle of the bay that become the 'symbol' of Arcachon. Other boat trips will also take you to the bird sanctuary (see below) and to the point where Arcachon Bay meets the ocean. Arcachon Zoo is about 10km away and is popular with children. Cycling is extremely popular in Arcachon and if you bring a bike with you (or hire one) there is a lovely promenade and cycle path that heads south from the beach and continues 30 kilometres to Biscarrosse, via various beaches and coastal towns en route. If you enjoy cycling, don't forget that the whole Arcachon coast is backed by the largest forest in western Europe - Les Landes. Until a hundred years ago this was just infested swamp, but was reclaimed and planted with pine trees, and is now a Regional Natural Park criss-crossed with cycle paths. second, the views from the top are simply stunning - out to sea, along the coast, and back across the dunes and Les Landes forests. Fabulous! This ornithological wonderland, 14 kilometres to the east of Arcachon, is one of just two bird sanctuaries in France. Previously the area was a wetland swamp, and continues to attract very high numbers of birds - reputedly more than 250 species, including several very rare birds. such as the spoonbill, the little egret and the black kite. There are quite a few pairs of stork nesting in the parc, these are a really amazing sight with their massive nests. Many of the birds can be seen from the observation points along marked out walks through Teich Parc.